Special thanks to Flamingo Hotel By The Beach, Penang for extending this hotel review invitation. 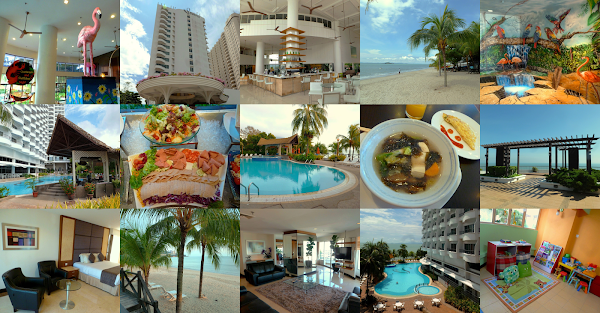 Flamingo Hotel By The Beach, Penang is a 4-star hotel in Tanjung Bungah. The 280-room hotel stands 17 floors in height. There are several classes of accommodation ranging from deluxe rooms to multiple-bedroom suites. In case this hotel sounds familiar to you, this is because it has a sister property called Flamingo Hotel By The Lake, Kuala Lumpur in Ampang, Selangor. Flamingo Hotel boasts a spacious al fresco lobby which takes advantage of the cooling breeze from the sea. Right next to the reception desk is Flamingo Theque, a trendy bar where alcoholic and non-alcoholic beverages are served. The lobby level also houses gift shops, hair saloon, spa center and a travel desk for the convenience of guests. Flamingo Theque's deck opens up to a scenic view of the hotel's swimming pool and the sea beyond. Thanks to the perpetual flow of marine breeze, hanging out at Flamingo Theque is undoubtedly a pleasant experience. Upon check-in, each guest is given a welcome drink voucher which can be redeemed at Flamingo Theque from 6:00pm to 10:00pm of the same evening. The welcome drink is typically mixed fruit punch. My deluxe room is furnished with a king-size bed, office desk, sofa chair and coffee table. Beyond the sliding door is a small balcony where guests can relax and enjoy some fresh air. It is fortunate that my room offers view of the sea; some rooms face inland instead. Each hotel room includes an attached bathroom with a shower stall. Bathtubs are only afforded to larger rooms. Basic toiletries such as toothbrushes, shampoo and shower cap are provided. Other in-room amenities include flat-screen television, Wi-Fi connectivity, minibar, electric water boiler, hair dryer and safe. As a resort hotel, Flamingo Hotel benefits from its adjacency to Tanjung Bungah's public beach, which is accessible from the hotel's grounds. Lined with shady palm trees, the sandy shore provides scenic views of the Strait of Malacca. Within a short distance from the coast is Pulau Tikus, a small island after which a district in George Town was named. Compared to neighboring hotels, Flamingo Hotel boasts a relatively large swimming pool. The ideal time to take a dip is in the morning. This is when the outdoor pool is shaded from the sun. Overall, the pool is well-maintained and is free from debris like plant litter. Next to swimming pool is the Beach Bar. Erected in the form of an attap-thatched shack, the bar allows swimmers to enjoy drinks and light snacks without leaving the wading pool. Beach Bar's Happy Hour is between 5:00pm and 7:00pm daily. During these 2 hours, customers enjoy 50% discount on draught beers and house wines. Flamingo Café is the hotel's main coffeehouse. While the indoor section is well-ventilated, guests may also opt to dine al fresco next to the pool. Besides an à la carte menu of continental dishes, Flamingo Café also serves buffet on certain days of the week. Flamingo Café is also where hotel guests are served breakfast. Above a flight of stairs next to Flamingo Café is the hotel's fitness center. There are over a dozen pieces of exercise equipment. As an added bonus, the fitness center provides good view of the swimming pool. The Kid's Club is located next to the hotel's lobby. This facility allows children to pass time while their parents go about their vacation activities like sunbathing or getting spa treatments. Available for use between 9:00am and 6:00pm daily, the Kid's Club is furnished with a decent collection of toys, books as well as a small playground. Should children prefer to play outdoors, Kiddies Corner is situated next to the swimming pool. Guests who enjoy taking photos should also check out the trick artwork near the Flamingo Ballroom. The artwork places emphasis on birds especially flamingos, which should not come as a surprise considering the hotel's name. In fact, Flamingo Hotel also boasts a modest-size aviary on the other side of Flamingo Ballroom. Sheltered by palm trees, several fowls are raised for guests' viewing pleasure. In fact if you are an early waker, you can even hear the rooster's crowing in the morning. Unlike its sister resort, this Penang property does not have actual flamingos within its grounds. However, the majestic sulphur-crested cockatoo (Cacatua galerita) in the aviary is a charming star on its own. Perched at the top floors are two Presidential suites that offer an exceptional class of luxury to privileged guests. Each unit has around 3 times more floor space than a standard deluxe room. Fit for a king, each Presidential suite is furnished with a spacious living room with panoramic views of the sea. One of these suites opens up to a large balcony with a hot tub and sunlounger. Viewed from high above, the panoramic scenery is magnificent indeed. Upon special request, Flamingo Hotel can also lease this space for weddings or private parties. Each hotel room usually includes complimentary buffet breakfast for two. Breakfast is served at Flamingo Café from 7:00am to 10:30am. Western-style breakfast includes cold cuts such as chicken ham and beef salami. There are also meatloaf, corned beef and chicken garlic sausages. Pastries that are served today are butter croissants, Danish pastries and muffins. French toast and mini pancakes are also staple items for breakfast. There are also sandwich bread and wholemeal bread with spreads like butter, jam and marmalade. Breakfast cereals include Frosties, Honey Gold Flakes, Froot Loops, Coco Pop, Rice Krispies and All-Bran. Alternatively, try some sweet muesli and strawberry yogurt for a nourishing boost of energy. The breakfast egg corner is situated at a wooden hut right outside the dining hall. Guests may enjoy various egg dishes according to their liking. Choices include fried egg, scrambled egg and omelette. Another action counter serves Young Tau Foo (酿豆腐), which is served in clear chicken soup with seaweed. Guests may customize the soup's ingredients like okra (lady's fingers), eggplant (brinjal), soft tofu, tofu skin (腐皮), tofu puff (豆腐卜), squid balls, cabbage and choy sum (菜心). Food is cooked to order, so the waiting time can be substantial when there is a long queue. Other Asian dishes include nasi lemak (coconut milk rice), fish porridge, fried rice and fried bihun (炒米粉). There is also a section of the buffet line that is dedicated for vegetarians. Fresh milk and chocolate milk are great drinks to start the day. They are also meant to go with breakfast cereals. For something fruity, guests can help themselves with orange and guava juices. Meanwhile, hot coffee and tea allow caffeine-powered individuals to get their morning fix. If you have free time between breakfast and check-out time at noon, take a casual stroll along the beach before the sun becomes too hot. The tranquil walk a nice finale to a pampering stay at Flamingo Hotel. Directions: Traveling westbound on Jalan Tanjung Bungah, drive past the pedestrian bridge near Dalat International School. Make a U-turn at the next traffic light-controlled junction and immediately turn left to Flamingo Hotel. The hotel provides complimentary outdoor and indoor parking.